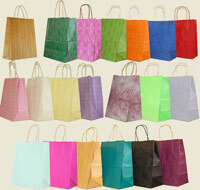 Paper Gift Bags. 8" wide x 4.5" deep x 10" high Bags. Versatile, inexpensive but oh so attractive to hold those special gifts! Don't forget the bag filler using shred and/or tissue.